The earliest expressions of love linked to St Valentine’s Day are found in the Middle Ages. The most famous is Geoffrey Chaucer’s reference to Valentine’s Day in The Parliament of Fowls, which depicts birds choosing their mates on the feast day: ‘For this was on Seynt Valentynes day, Whan every foul cometh there to chese his make’ [For this was on Saint Valentine’s Day, when every bird comes to choose his mate, lines 309-10]. Less well-known is the fact that several of Chaucer’s contemporaries – Otton de Grandson, John Gower, Sir John Clanvowe, Christine de Pisan and John Lydgate – also wrote about Valentine’s day and helped to further its connection with romantic love. 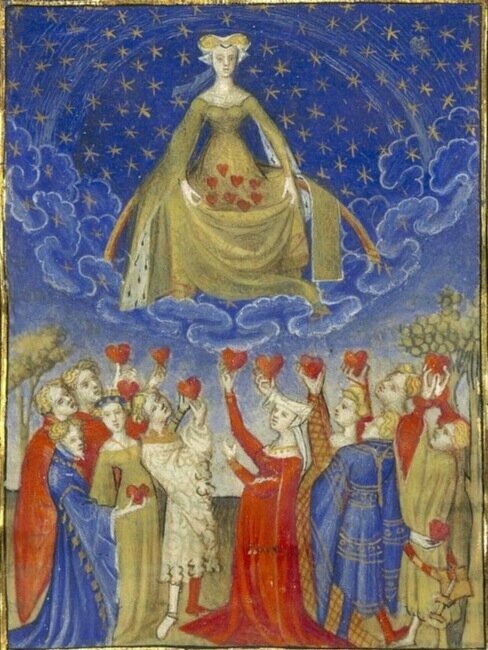 Venus collecting medieval hearts in Bibliothèque nationale de France, Français 606. Et moy pour vous fus trop tost né. And I for you was born too late. M’a de vous, pour toute l’année. Me from you for the whole year. Combien qu’Amours l’eust ordonné. How much that Love would have commanded. Ma tres doulce Valentinée. My very gentle Valentine. The oldest known love letter associated with Valentine’s Day in the English language also survives from the fifteenth century. Preserved in the British Library, it is part of a larger collection of letters written by members of the Paston family of Norfolk. The Valentine letter, written in February 1477, was sent to John Paston by Margery Brews, who swiftly followed it up with another message in reply to Paston’s lost response. In the two documents she tells her ‘welbelouyd’ [well-beloved] John that she has asked her mother to encourage her father to increase her dowry, but that an increase may not be possible, so, if he loves her, he should be prepared to marry her without the pledge of more money. Her remarks about feeling wretched and longing to see John strike a particularly poignant and timeless note, as does her request that ‘non erthely creature safe only your-selfe’ [no earthly creature but yourself] see her letter. Since Margery and John did eventually marry – presumably making Margery the ‘meryest mayden on grounde’ [the happiest maiden on Earth] – her letters are offered below as a testament to the power of love and the emergence of Valentine’s Day in medieval England. 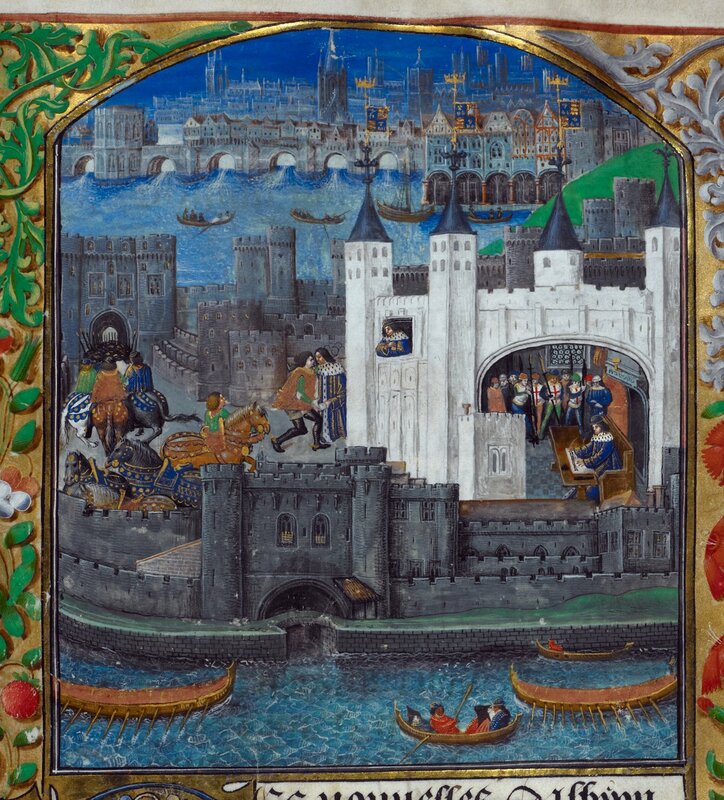 Vnto my ryght welbelouyd Voluntyn John Paston, squyer, be this bill & delyuered, &c. Ryght reuerent and wurschypfull and my ryght welebeloued Voluntyne, I recommande me vnto yowe full hertely, desyring to here of yowr welefare, whech I beseche Almyghty God long for to preserve vnto hys plesure and yowr hertys desyre. And yf it please yowe to here of my welefare, I am not in good heele of body ner of herte, nor schall be tyll I here from yowe; For ther wottys no creature what peyn that I endure, And for to be deede I dare it not dyscure. And my lady my moder hath labored the mater to my fadure full delygently, but sche can no more gete then ye knowe of, for the whech God knowyth I am full sory. But yf that ye loffe me, as I tryste verely that ye do, ye will not leffe me therfor; for if that ye hade not halfe the lyvelode that ye hafe, for to do the grettyst labure that any woman on lyve myght, I wold not forsake yowe. And yf ye commande me to kepe me true whereeuer I go iwyse I will do all my myght owe to love and neuer no mo. And yf my freendys say that I do amys, thei schal not me let so for to do, Myn herte me byddys euer more to love yowe truly ouer all erthely thing. And yf thei be neuer so wroth, I tryst it schall be bettur in tyme commyng. No more to yowe at this tyme, but the Holy Trinité hafe yowe in kepyng. And I besech yowe that this bill be not seyn of non erthely creature safe only your-selfe, &c. And thys lettur was indyte at Topcroft wyth full heuy herte, &c. Be your own M. B. This entry was posted in The Parchment Mirror and tagged Charles de Orleans, Chaucer, Christine de Pisan, courtly love, Geoffrey Chaucer, Guy Ritchie, John Clanvowe, John Gower, John Lydgate, John Paston, King Arthur, Margery Brews, medieval, medieval love, medieval lovers, Medieval Valentine, Middle Ages valentine, Otto de grandson, Paston Letters, Valentine, Valentine Day, Valentine's day on February 13, 2013 by Sarah Peverley.